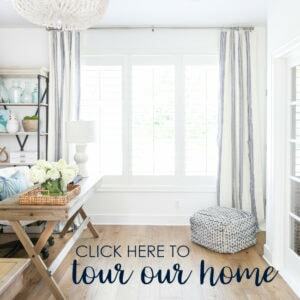 Welcome to the Styled + Set Valentine’s Day entertaining tour! Today I’ve teamed up with a great group of bloggers, hosted by Lory from Designthusiasm, to share some Valentine’s Day entertaining ideas! This is the same group I team up with each holiday because they are always so inspirational and always provide so many great ideas! If you’re stopping in from French Garden House, welcome! To be honest, Valentine’s Day isn’t my favorite holiday. 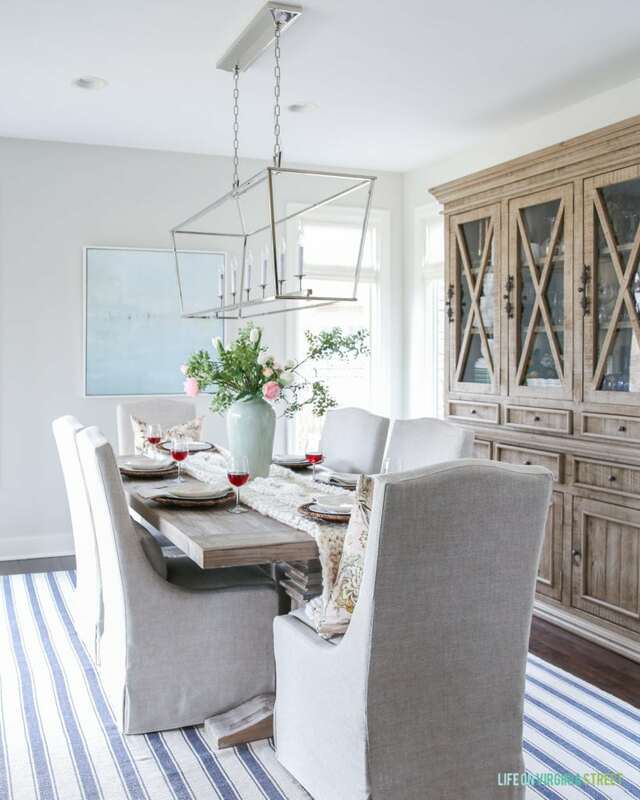 But, it’s always fun to change up the decor and host for any reason we can! I challenged myself not to buy anything new for this tablescape, and I succeeded with one tiny exception. 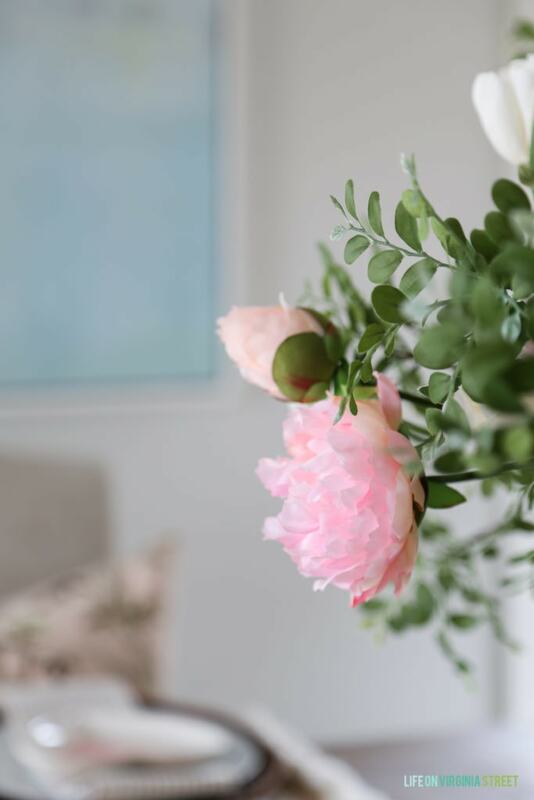 I traditionally decorate in blues, greens and neutrals, so it was fun to add pops of blush pink to my Valentine’s Day tablescape. I started by using the blush pink pillows from my fall guest bedroom (in this fabric) and then went from there. I was going to purchase fresh flowers, but the reality is, with our cats, I always give them away the same day. So, I opted to invest in some faux peonies and faux tulips. They were my only purchase for the tablescape, and I love that I can use them for many springs to come! I then mixed in my favorite faux green petal stems that I already had on hand. 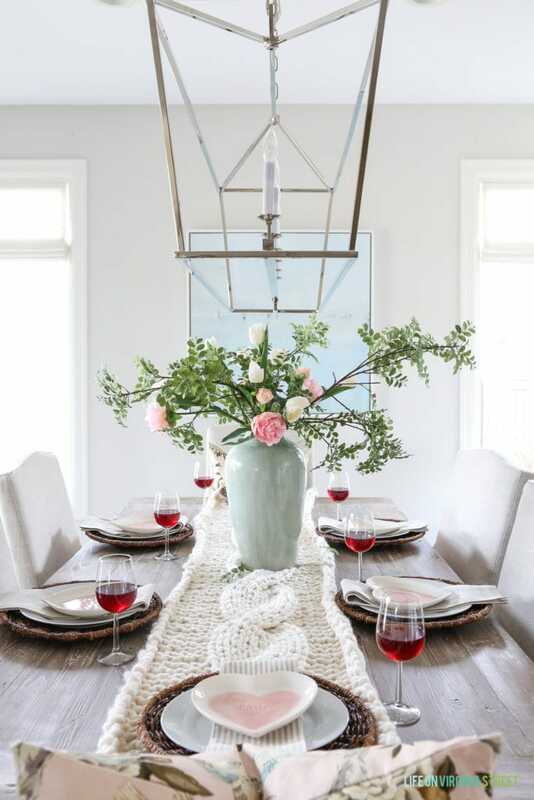 The chunky knit table runner is perfect for the winter months (similar options available here). 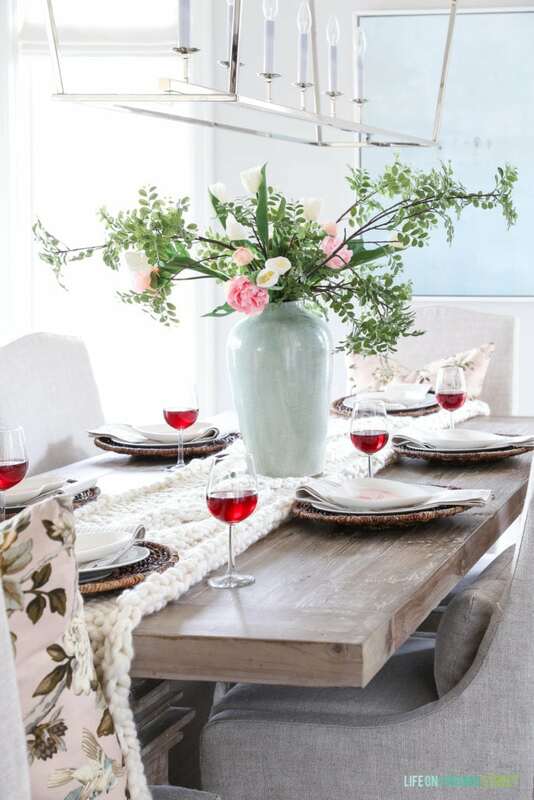 It adds so much texture and warmth to the tablescape! The ribbon-like edges of the faux peonies look so realistic. I’m excited to continue using them through the summer months, as well! I used these heart shaped plates last year, and still love them so much! They remind me of the sugar cookies my mom makes and ships to us each year for Valentine’s Day! I paired them with natural chargers (I basically use these every season) and striped napkins I already had on hand. I’m loving the combo! The floral centerpiece is a bit chaotic, but I kind of love the organic vibe it brings to an otherwise formal place setting. I served a sweet red Iowa table wine that my in-laws gave us. Not only is the flavor perfectly sweet, but the color looks so great for Valentine’s Day. It’s a win-win! I hope you enjoyed my Valentine’s Day Tablescape. I’ve listed all sources below. The next stop on the tour is the talented Julie Blanner! 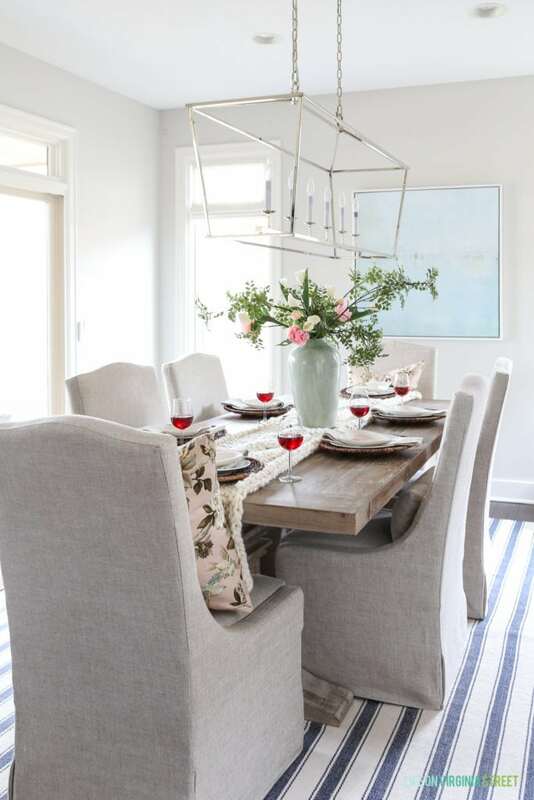 Julie’s home exemplifies understated elegance and I love to follow along with her blog – be sure to stop by and see her Valentine’s idea. I’ve also included all the links to the other stops on the tour below. Enjoy! That is the perfect table!! Definitely going to copy. The runner seems to be sold out. Are you seen any other sweater chunking table runners? Love your blog!! Sarah, that chunky knit runner is awesome!! What great look for a winter table setting! Love the heart plates too, and they look great with the striped napkins. Lovely!! I love that amazing chunky knit runner – I’ve never seen anything like it! I’m thinking I need to have that for my next winter table for sure:) And of course, the adorable pink plates (I have them too!) are too cute! Yours is my favorite:) It’s the perfect touch of beauty, simplicity, and romance. What a beautiful table! I love the feel of the cozy knitted runner. Thanks for sharing! 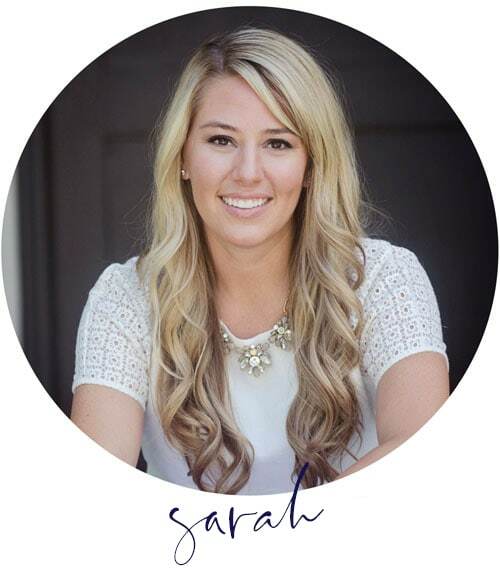 Love your table, Sarah! 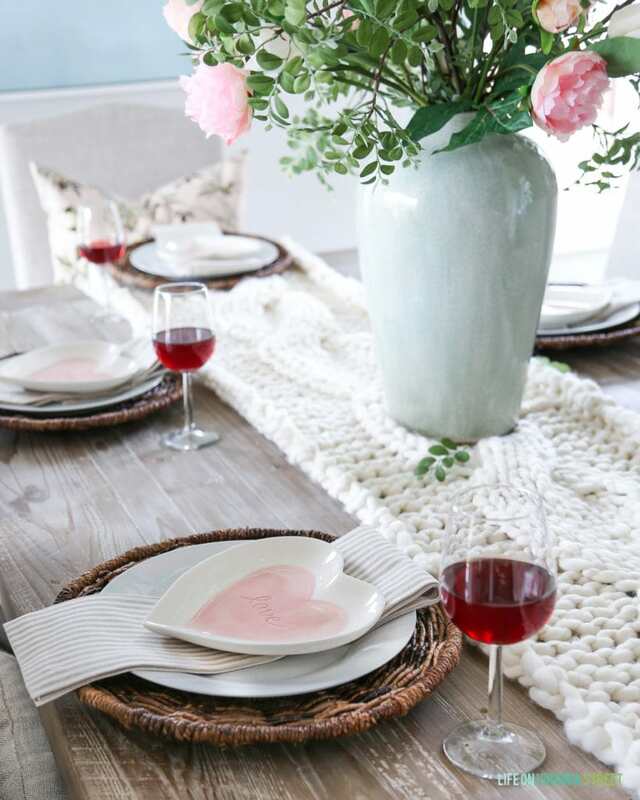 I want those heart plates and table runner! So beautiful. The faux floral arrangement is stunning! I have never seen a faux display look so real! The whole scene is beautiful. Thank you for sharing.